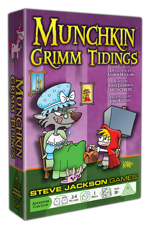 Despite the name of the game, these tidings are nothing but good: Munchkin Czar Andrew Hackard wrote some Designer's Notes on Munchkin Grimm Tidings! Find out just what trials and tribulations he faced in bringing Grimm's Fairy Tales to Munchkin. For example, you'll learn why it's got fewer cards than your typical Munchkin core set, how the classes were chosen, and more. Also, fun fact: A runner-up for the name of the set was Munchkin Grimmdark. Ah, what might have been. Meanwhile, the game itself is on shelves only at Walgreens stores. It's the first Munchkin game available there, so be sure to pick up a copy next time you're picking up your prescription or household essentials!